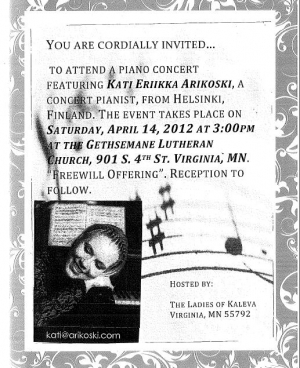 Kati Eriikka Arikoski have been invited to play a solo concert at the Gethsemane Lutheran Church in Minnesota by organization Ladies of Kaleva. Leevi Madetoja's Pastoral Suite was originally composed as a piano work in 1916. It is a suite with four small songs that come closer in nature to salon music. The first movement "Morning" is to some extent emanating the influence of Norwegian composer Edward Grieg. The second movement is a lively Caprice. The typical caprice is one that is fast, intense, and often virtuosic in nature. The third "Legend" is dominated by the static, melancholy mood typical of Madetoja, and a finally "Waltz" marked at times by unpredictable rhythms.